BBQ grills on residential properties cause more than 1500 structural fires and 4200 outdoor fires every year. 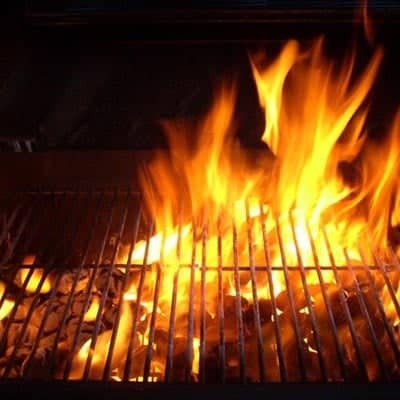 Did you know many BBQ grill fires happen when a propane grill was used for the first time after winter storage? Check all the tubes leading into the burner of your propane grill for any blockages. Inspect the hoses for cracking, holes and leaks. Never use a flame to check for leaks. Move propane hoses as far as possible from hot surfaces and dripping grease. Do not attempt to repair the propane tank valve or the appliance yourself. Remember that BBQ grills are designed for use outside. Use utensils with long handles to avoid burns and splatters. When transporting a propane tank, it should be secured in the back seat of your car, with transportation plugs on the outlet valve connection. Never leave the tank unattended in your car and avoid traveling with other passengers, especially children.